Countries around the world have cuisine that recalls important historical and cultural memories for the people who call it home. But what makes traditional dishes in Asia different from those in Europe or South America? After all, both Brazil and China eat their fair share of pork but each country has a unique flavor that relies on centuries of culturally influenced cuisine. 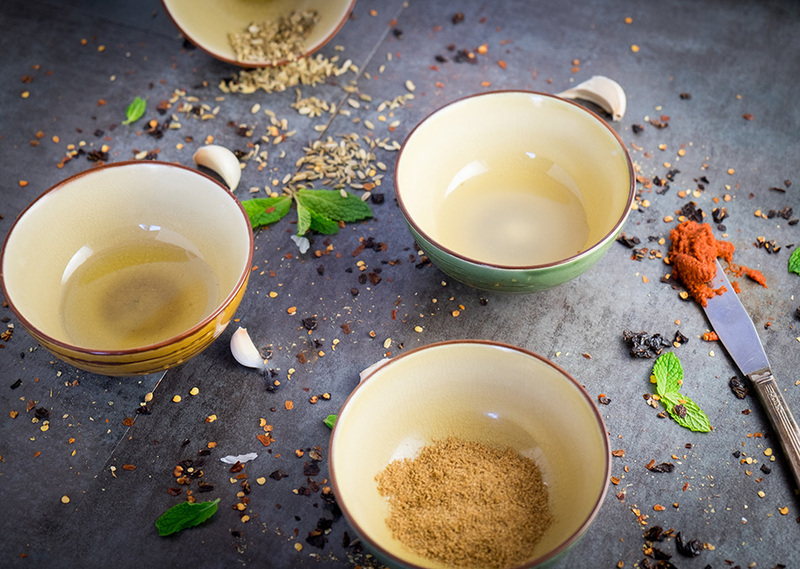 The answer to each continent’s singular taste may be in part the aroma created by spices native to that region. As humans, our memories are intertwined with smell more than any other sensation. The olfactory bulb in the nose enjoys a direct connection to the brain rather than having to relay sensation through the nervous system, making smell one of the first senses we use to recall memory. When our brains file away something, it gets cataloged with the sensations that were a part of that moment, like that fantastic trip you took to Portugal that comes to mind everytime you smell the sea. 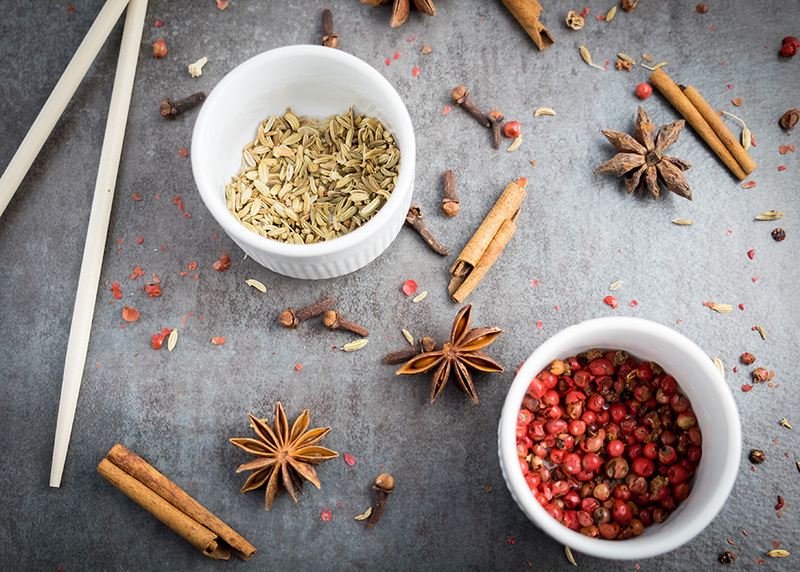 Later, when we indulge in nostalgia around the holidays, the smell of spices can be one of the first things our minds connect to that special moment. Smells, especially ones that communicate warmth and seasonal traditions, can be a profound source of personal and cultural comfort. Let’s wander the world a bit to get a sense of not only which celebrations each continent enjoys, but the regional spices that communicate warmth in that region and bring memories of family and comfort home for the holidays. Peek into kitchens across America during the holidays and you’ll smell cookies in the oven and the fragrant warmth of cups of hot chocolate or eggnog in hand. Both Christmas and Hanukkah are widely celebrated across North America and both traditions heavily emphasize baking sweets, with a special emphasis on the warmth of cinnamon. Cinnamon is technically a bark, but the ground remnants are widely used along with vanilla extract in many holiday baking recipes. 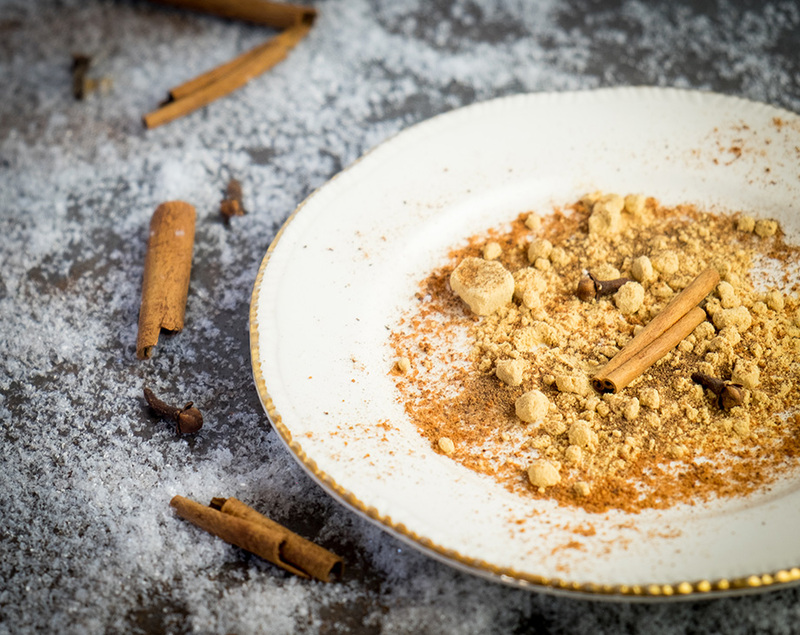 This spicy bark is prominent feature of one of America’s most notorious seasonings, pumpkin pie spice, best known as an additive for lattes that have become a symbol of chillier weather. Spice it up: It’s a bit of a cliche but pumpkin pie spice has become a hallmark of America’s obsession with cinnamon and spice and everything nice. But you don’t have to stop by the coffeeshop to get your fix since pumpkin pie spice is a combination of five different spices you probably already have in your pantry. Warm up your language skills: If you want to sound like a local, use the phrase “bundle up!” It’s an American colloquialism that refers to putting on a coat, hat, and mittens to brave the cold. Recipe for Pumpkin Pie Spice: Mix 3 Tbsp. cinnamon, 2 tsp. ginger, 2 tsp. nutmeg, 1 ½ tsp. all-spice, and 1 ½ tsp. ground cloves. You may think Kwanzaa when you hear Africa for the holidays, but that’s actually an American adaptation of the holiday that isn’t widely celebrated in Africa. While it may surprise Westerners, nearly half of Africa is practicing Christian and Christmas is celebrated widely throughout the continent. Church attendance, the nativity, and caroling are all a focus of African holiday celebrations as well as gift giving. Because Africa is located in the Southern hemisphere, Christmas arrives in the middle of summer so traditional holiday cuisine tends to focus on cooling things down with puddings. A traditional dish of glazed gammon adorns South African holiday tables and may be accompanied by a spicy side of harissa, a paste of spices and ingredients native to the continent. Spice it up: Harissa is actually a spice paste, made up of smoked peppers and spices that are often used as a flavoring agent or just as a condiment to accompany meats and fish in African cuisine. It’s fairly easy to duplicate the paste in your home with a few fresh herbs and some smoked chilis. Recipe for Harissa: Process 10 dried chiles, stemmed and seeded, 1⁄2 tsp. caraway seeds, 1⁄4 tsp. coriander seeds, 1⁄4 tsp. cumin seeds, 1 tsp. dried mint leaves, 3 tbsp. extra-virgin olive oil, 1 1⁄2 tsp. kosher salt, 5 cloves garlic, and the juice of 1 lemon in a food processor. While Christmas is sometimes celebrated in the larger Chinese cities, most of Asia has different festivals that have become seasonal holidays. In India, Hindus celebrate Diwali, or the Festival of Light, as the biggest holiday and it spans five days of celebrations. China’s most widely celebrated holiday is the Chinese New Year, which occurs in January or February. The Chinese often prepare special sweets during this time using sesame seeds, five spice, almonds, and other nut pastes. Warm up your language skills: In China, approaching something with gusto isn’t reserved for just eating.The phrase 津津有味 (jīn jīn yǒu wèi) implies keen interest in anything from a delicious holiday cookie to a newspaper article. Recipe for Chinese Five Spice: 1 tsp. cinnamon, 1 tsp. cloves, 1 tsp. fennel, 1 tsp. star anise, and 1 tsp. Szechuan peppercorns. Christmas is widely celebrated all over the European continent with various traditions in each country. Russia also celebrates the holiday, but because they follow the Russian Orthodox calendar, Christmas falls a little later in the month of January. Baking is also a common way to celebrate the season in Europe, but the cuisine tends to have less emphasis on cookies and candies and incorporates more cakes and puddings. Spice it up: While North America is addicted to cinnamon, Europeans have a preference for the spicier flavor of ginger. This root can be used fresh or dried and is the main ingredient not just in gingerbread but also the star of warming holiday drinks like wassail. 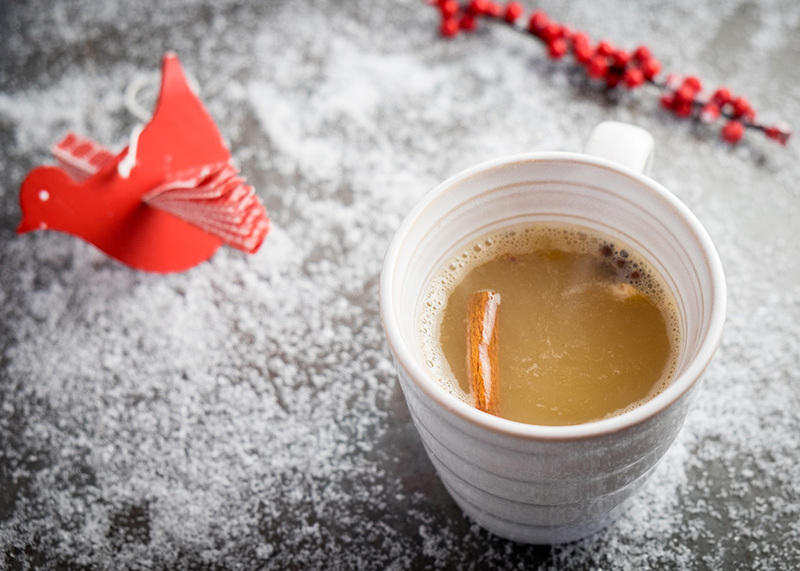 This steaming cup of seasonal cheer is made up of fruit juices and spices steeped for up to an hour. Warm up your language skills: Turkish coffee is famous the world over and this idiom, used to communicate the honor of drinking a warm cup with a friend, literally translates to: “A cup of Turkish coffee offered (shared) will be remembered for forty years.” This means that the person who offers the coffee is to be respected and remembered for a long time for the sake of their offering. Recipe for Traditional Holiday Wassail: Combine 1/2 cup apple cider, ¼ cup orange juice, 1 Tbsp. lemon juice, 1 cinnamon stick, 2 whole cloves, 1 tsp. ground ginger or slice of fresh ginger root, and a sprinkle of ground nutmeg. Bring to a boil, then lower heat and simmer for 15 minutes to an hour. Serve warm. The holidays are an important part of the year in Latin America, where celebrations can be a marathon event and continue for up to nine days before Christmas. These celebrations are referred to as the Navidad and the journey of Mary and Joseph is often reenacted. Big family-style dinners are definitely a seasonal tradition where jerk flavored meat dishes are a feature, often followed by Panettone, the Latin American version of fruitcake. 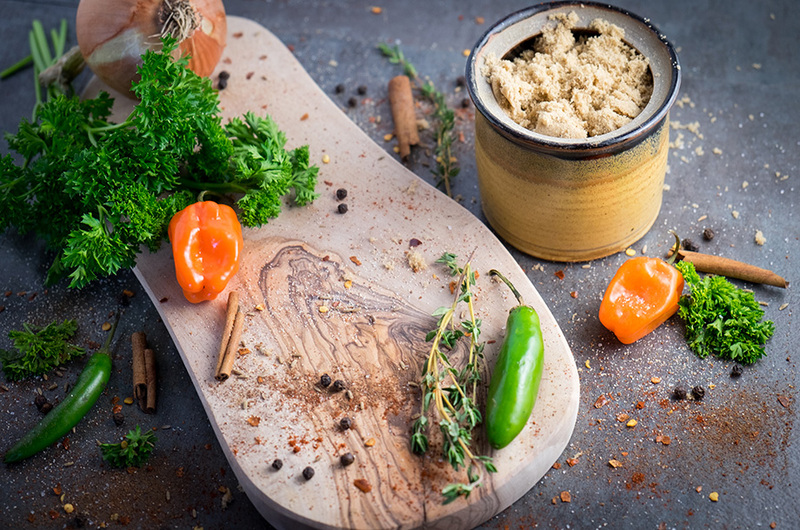 Spice it up: Jerk seasoning is famous in Jamaica, where it originated as a way to flavor barbecue, but it’s also a blend of peppers and spices that are used throughout the Caribbean and Latin America. Jerk seasoning often incorporates a variety of spices that can add up to quite a mouthful. Warm up your language skills: This Spanish word is often used in Mexico and doesn’t really have an English equivalent, although it definitely should. ¡Enchilarse! means you’ve eaten something far spicier than you can handle and your lips are burning or your face is on fire. Head for a glass of milk though instead of water since the fat in milk helps dull the taste buds and deflect the sting of capsaicin, the chemical that makes peppers taste so hot. Recipe for jerk seasoning: 2 tsp.onion powder, 1 tsp. garlic powder, 1 tsp. cayenne pepper, ½ tsp. smoked paprika, ¼ tsp. allspice, ½ tsp. salt, ½ tsp. black pepper, 1 tsp. red pepper flakes, ½ tsp. cumin, ¼ tsp. nutmeg, ¼ tsp. cinnamon, 1 Tbsp. brown sugar, ½ tsp. Fresh thyme, and ½ tsp. fresh parsley. Countries across the Middle East primarily practice Islam so their largest holiday celebration centers around Ramadan. Ramadan emphasizes charity towards the less fortunate and is typically celebrated in the early spring.This holy month of fasting is marked by special meals that occur after dark, where families gather and share a communal experience. Maqloubeh, a Palestinian rice dish served during Ramadan, is flavored with baharat. 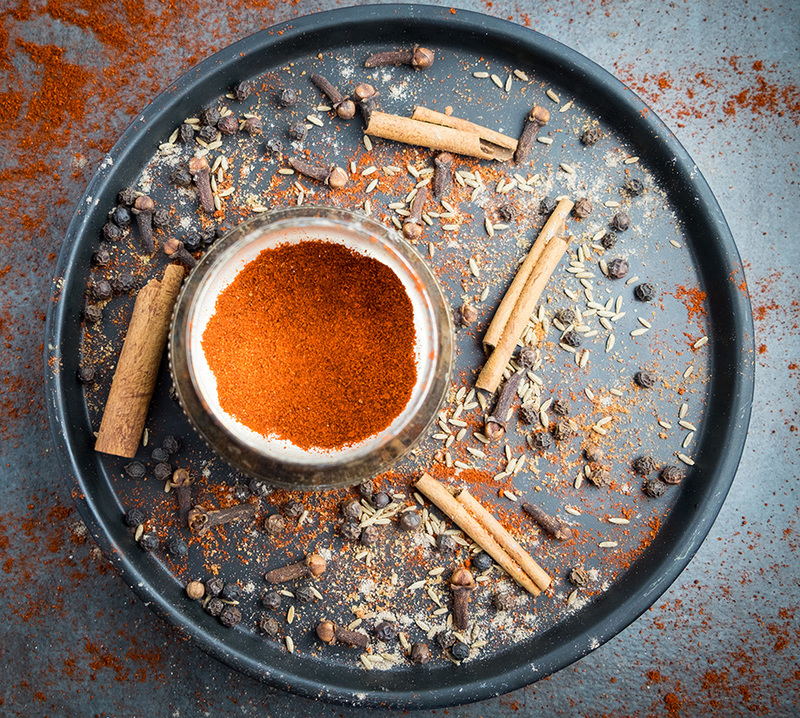 Spice it up: Baharat is a blend of spices used in the Middle East to spice meat, soups, and as a condiment. The bright color comes from paprika, which is the base of baharat. Recipe for baharat: Combine 4 Tbsp. ground black pepper, 2 Tbsp. ground coriander, 2 Tbsp. ground cinnamon, 2 Tbsp. ground cloves, 3 Tbsp. ground cumin, 1 tsp. ground cardamom, 4 tsp. ground nutmeg, and 4 Tbsp. paprika. Have a smell that reminds you of happy times during the holidays or a spice that reminds you of home? Share it with us in the comments and spread some seasonal cheer. Traveling abroad for the holidays? 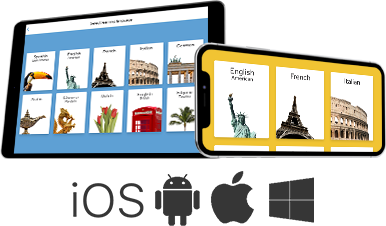 Take Rosetta Stone with you. Try the demo for free today.